The United States Congress designated the Weminuche Wilderness (map) in 1975 and it now has a total of 497,061 acres. All of this wilderness is located in Colorado and is managed by the Forest Service. 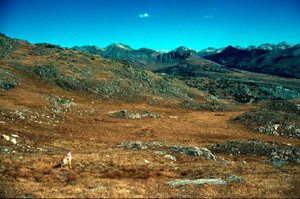 The Weminuche Wilderness was designated in 1975, and was expanded to its current size by the Colorado Wilderness Acts of 1980 and 1993. It is the largest designated Wilderness in Colorado. The Weminuche lies in the San Juan and Rio Grande National Forests of southwestern Colorado. Its average elevation is 10,000 feet. Eolus, Sunlight, and Windom Peaks rise above 14,000 feet in elevation, while many others reach above 13,000. Fifty miles of the Continental Divide, the geological backbone of North America, dissect the Weminuche, diverting its headwaters to either the Pacific or Atlantic oceans. Planning to Visit the Weminuche Wilderness? How to follow the seven standard Leave No Trace principles differs in different parts of the country (desert vs. Rocky Mountains). Click on any of the principles listed below to learn more about how they apply in the Weminuche Wilderness.